I've had my serious hat on for a couple of weeks now, mostly due to deadlines and commitments. I believe that's partly how these rainbow meringue cones came about. I just couldn't take one more day with a furrowed brow. And do you know that rainbow treats are the opposite of a furrowed brow? They are. Another reason why these rainbow puffs made it onto my baking sheet is because ThinkGeek sent me a Sprinkles the Unicorn Sprinkle Shaker. It's just the cutest thing. I've been waiting for the right inspiration to use it in a blog post, and I felt something rainbow-themed was in order. 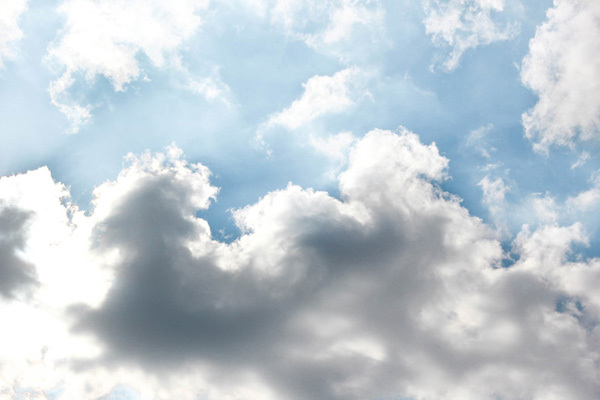 This morning while drinking coffee and cloud gazing (I do that sometimes when the clouds are extra puffy), I saw a vaguely horse-shaped cloud illuminated by light, and felt it was a sign to use my unicorn shaker today. Do you see it too? Practically a unicorn without a horn, right? Because the folks at ThinkGeek are so awesome, they sent along another Sprinkles the Unicorn shaker for a giveaway, and I'm opening the contest worldwide. You can enter with the Rafflecopter widget below. Email subscribers, please visit the blog post to enter. 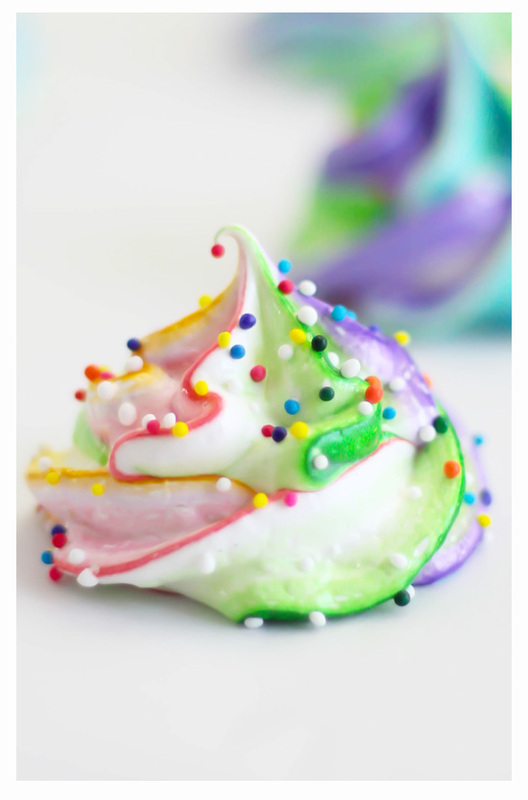 I'd never made rainbow meringues before, but it's really easy. Just fit a piping bag with a decorator tip, and then paint long stripes of gel food color on the inside of the piping bag using an artist's brush. Space the painted stripes out if you'd like some white meringue showing, or if you want a solid rainbow, place the stripes very close together. Here's my sprinkle shaker in action! I tried all kinds of sprinkles in the shaker, and found that rainbow nonpareils work best. Sprinkle the piped meringues just before you put them in the oven. The sprinkles won't melt away because the meringues are baked at a very low temperature. I decided to make the meringues into cones because the colorful swirls reminded me so much of these little treats I ate as a kid. They were always stale, but I loved them anyway. I filled the cones with chocolate ganache, which makes the finished dessert taste like exactly four bites of rich chocolate tart. The sugar cone makes a great "crust". 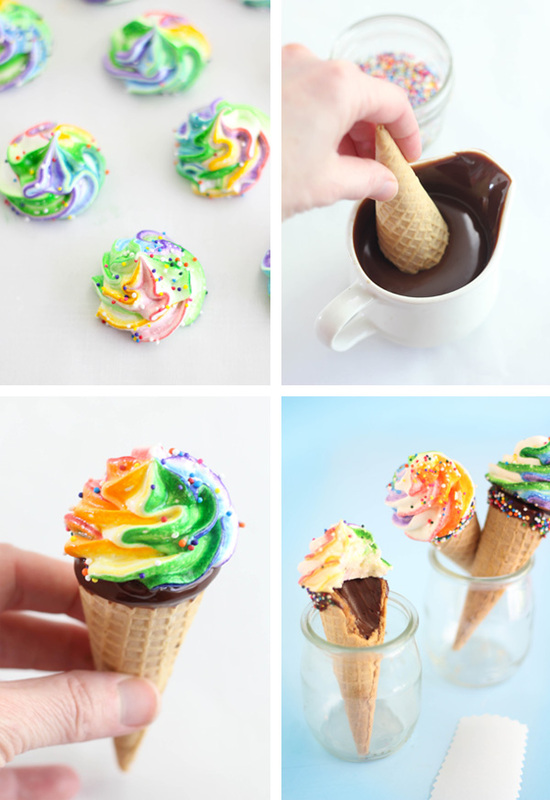 Even though these ice cream cones are the non-melting sort, I think they'd be a cute addition to an ice cream social. It's good to have something a little different and unexpected. Hope everyone is having a GREAT summer! 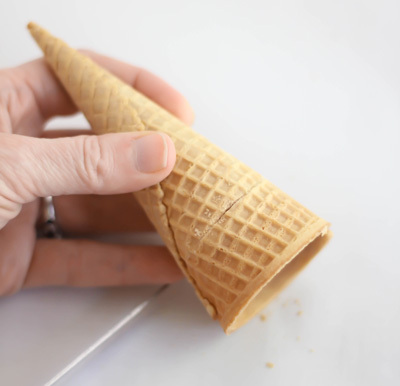 If using standard size sugar cones, trim about two inches from the top by scoring the cone with a serrated knife. Break the top at the scored mark and save the excess for later use (on a bowl of ice cream!). In a large microwave-safe bowl, combine the chocolate pieces and heavy cream. If any chocolate pieces are poking above the surface of the cream, then pat them down with the back of a spoon. Heat at 30 second intervals or until the mixture can be whisked smooth. Allow the ganache to cool at room temperature until slightly warm but still pourable, about 30 minutes. Pour the ganache into the upright standing cones. Transfer the cones to the freezer until set. Meanwhile, prepare the meringues. Fit a piping bag with a large closed star decorator tip (Ateco 843). Set aside. Whip the meringues in a standing mixer until frothy and add the cream of tartar. Beat on high until soft peaks form and gradually add the sugar. Beat on high speed until the meringue is thick and glossy, and will hold a standing peak with the beater is lifted from the bowl. Cover two baking sheets with parchment paper and preheat the oven to 170F. 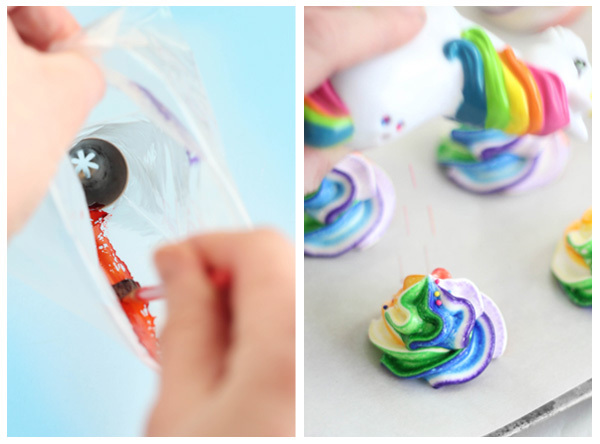 Using an artist's brush, paint thick 1/2-inch stripes of each gel food color inside the piping bag, cleaning the brush between colors. If you want a true rainbow effect paint the colors in this order once around the inside of the piping bag: red, orange, yellow, green, blue, violet. Place the meringue inside the piping bag. Don't worry if the colors smudge - it'll all be okay in the end. Pipe the first one or two meringues back into the bowl - these will have no rainbow stripe, and the rainbow colors will intensify as you pipe the meringue. Pipe each meringue in two swirls, one on top of the other, to give it the appearance of soft serve ice cream. Bake the meringues for 40 minutes, then turn the pan halfway and bake for another 40 minutes. Turn off the oven and let the pans cool. You can leave them overnight if desired. 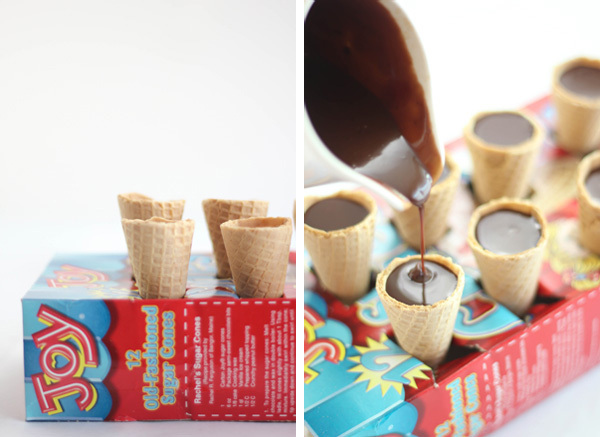 Dip the set cones into the melted chocolate and then dip the edges in the multicolor nonpareils. Up to one hour before serving, dip the bottoms of the meringues in a little chocolate and set them on top of the chocolate-dipped cones. Allow them to stand until the meringue is stable. Serve immediately. A few tidbits before I end this post! Etsy's front page - what hoot! Check out a recipe round up for summer cookout fare on TripAdvisor's FlipKey blog (you'll see a familiar watermelon cake there!). Check out my latest article for Betty Crocker, it's a sprinkle-coated Confetti Cake Roll! I put sprinkles on everything. I go overboard sometimes! When I was a child we had sprinkles on mini cupcakes and lightly buttered bread. These were called fairy cakes and fairy bread. My daughter was into fairies when she was little and we made these all the time. I make them now for the grandchildren and they love them just as much. I am a sprinkle addict! I sprinkle cookies, cakes, cupcakes, chocolate covered pretzels, chocolate covered strawberries, anything!! Extremely pretty! And your dog is irresistibly cute. Ooh I know just the group of young ladies who would love these beautiful cones! I'll surprise em at their next meeting with them! That sprinkle shaker is adorable. Sprinkles are fun for everyone, especially cupcakes and cake batters. I like rainbow sprinkles in my blueberry pancakes. Funfetti Blueblerry Pancakes!!! Love those! I shake sprinkles on cookies, cupcakes, blondies, and ice cream. 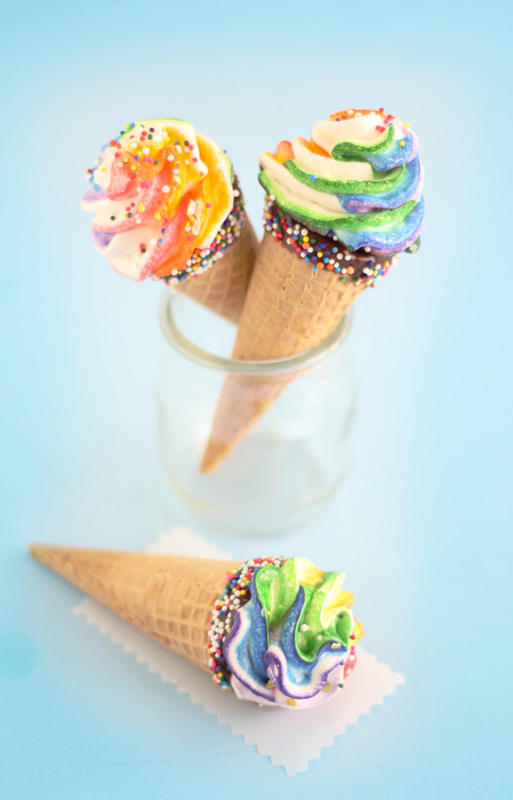 Cute cones! I'm a sucker for rainbows! I love sprinkles on my ice cream! Cupcakes, popcorn, cookies, ice cream...you name it. I'm sprinkle-obsessed. I will literally put sprinkles on anything. I even make my own flavored ones! I put sprinkles on pretty much everything - sometimes even cinnamon rolls! What don't you sprinkle sprinkles on? I put a few sprinkles in my protein healthy smoothie to pretend like I'm drinking a milkshake. cupcakes and doughnuts and cake pops !!! love them sprinkles!! This is so cool!! I absolutely love this idea! I use sprinkles on cookies! I like to put sprinkles in my cakes! Donuts, for sure! And cupcakes too. These are amazing! Sprinkles on everything, especially ice cream. I am SO making these! Thanks for all your inspiration!! You have the coolest goodies, love this idea, love the blog. Awesome! On cupcakes and cake pops! What are cupcakes without sprinkles? :) So cupcakes, of course! My sister sent this to me because she knows that I love rainbows, unicorns, meringue, sprinkles, and just about everything in this post. 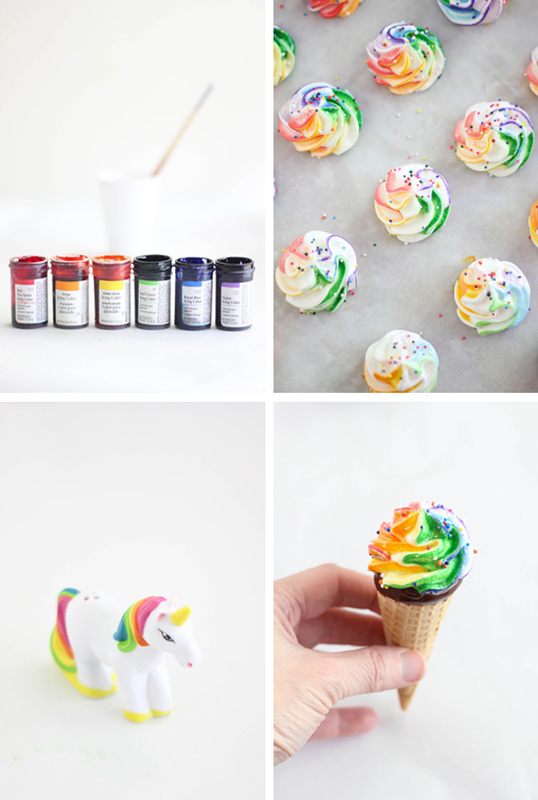 My sister sent me this post because I love rainbows, unicorns, sprinkles, meringues and just about everything in this post. I sprinkle standard sprinkles (jimmies) on my ice cream. Cupcakes often get sanding sugar. Frozen yogurt gets chopped almonds. I love sprinkles on mini cupcakes! Clearly everything is better with sprinkles!! Cupcakes, doughnuts, cookies, meringues, birthday cakes, trifle,strufoli,everything I want tot make special! Cupcakes and frosted brownies seem to get most of my sprinkles. these are almost too pretty to eat.. i think you've stumbled onto an awesome idea here! love it. I love sprinkles and put them on everything! I almost never use sprinkles to be honest, but they do look awfully pretty when I see other people use them. I had my bridal shower this past weekend and I received some unicorn pint glasses and a unicorn cork screw. Obviously I need this unicorn to complete my collection! This is so amazing! They actually look really tasty and sooo pretty too. As I'm super partial to rainbows I hope you don't mind if I share these in my next round up post on my blog kerry cooks? I'll link back of course! I put sprinkles on cupcakes! Sprinkle remind me of everything happy and summer. I put sprinkles on donuts and milkshakes! This is so cute! :D definitely will try this week. They look almost but not quite too good to eat! I'd put the sprinkles on cake for sure. Perhaps your fairy bread cake? I shake sprinkles on pretty much anything, including a cup of coffee a couple of weeks ago.. I put sprinkles on top of milkshakes! I'm not a big sprinkles fan, that being said, funfetti icing or a funfetti cake is my absolute FAVORITE. So yummy!!! Doughnuts, cake, brownies, cupcakes, or anything that I can possible make funfetti! These look like so much fun to make! Home made donuts (like the Homer Simpson variety)! Sprinkles make everything better! Esp. Cakes, cupcakes, and chocolates. I haven't done it in years (probably when I was still in elementary school), but I used to put sprinkles on my vanilla ice cream with chocolate sauce. It was heavenly! My mom and I make shortbread every Christmas in the shape of stars and we always decorated them with sprinkles. They were one of my favourites when I was little (still are)! And Funfetti cake/cupcakes are one of my favourites...no one has made that for my birthday yet, but I do love ice cream cakes for my birthday (even though it's in January lol!) and they sometimes have sprinkles. Not quite the same though lol. These are so precious! The colors, the swirls, the chocolate ganache... I'd order a dozen and keep them all to myself! :) As for shaking sprinkles, I usually do that with frosted sugar cookies and baked glazed donuts. They make everything cuter! These are the cutest desserts! I'm a rainbow sprinkles person my self, for everything!! I love sprinkles!! Ekkkk, just too adorable! I am so making these!!! My seven-year old is the unicorn, rainbow queen!! This is my first time visiting your blog and I've been here for several hours now - I discovered you via a Pinterest pin. You have a fabulous blog with fantastic recipes - thank you. I also wondered if you are a writer? Call me a nerd, but I noticed your immaculate grammar and punctuation. lol Annie (I can't figure out how to comment with my name - I don't have a blog to link to). Am I the only one who grew up calling "Sprinkles" "Jimmies". It might just be a mid-west thing. 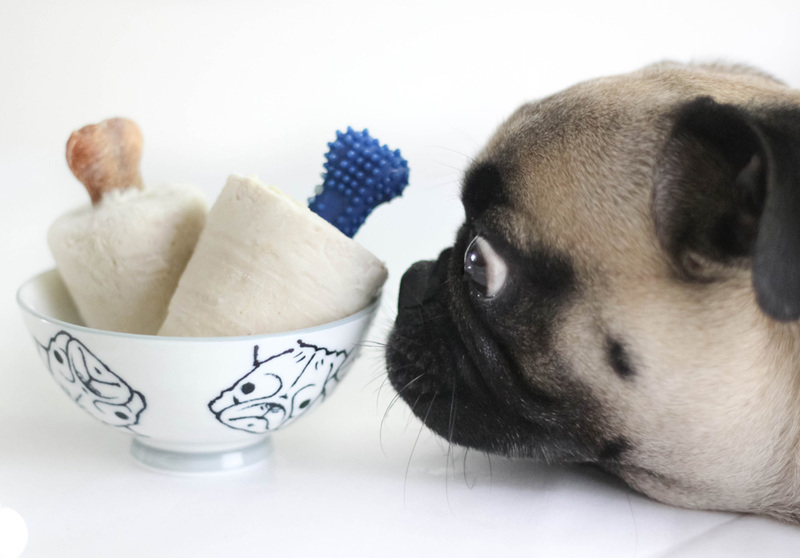 These ARE the most adorably fun treats! I've had a furrowed brow lately too. Maybe I need a batch of these! Your pup is just too cute! 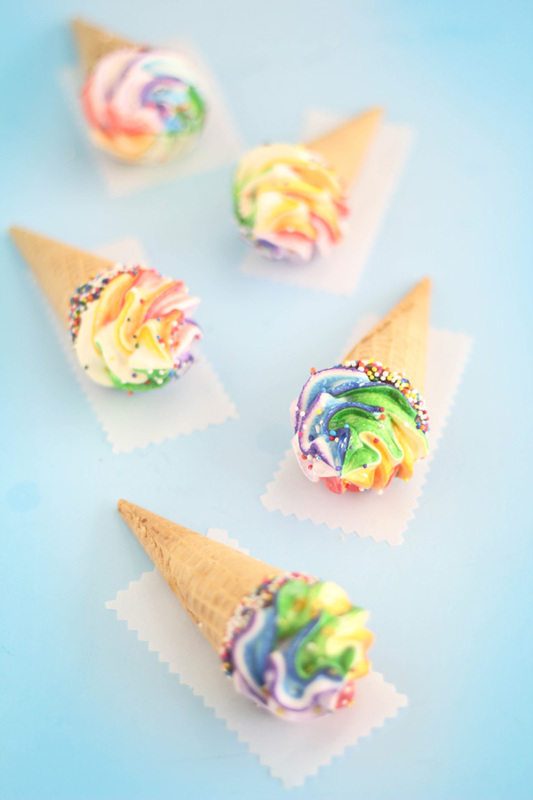 And these meringue ice cream cones are just too pretty. Bet they taste like heaven, too. I made these for my son's birthday today, and was very sad to notice that within an hour of being filled, the miniature cones had gone chewy. I'm wondering if you had this problem. They still look beautiful, but I hate eating cones that taste stale. Any suggestions for keeping them crisp? Thanks for the feedback. My cones were chewy the second day but we didn't mind that. 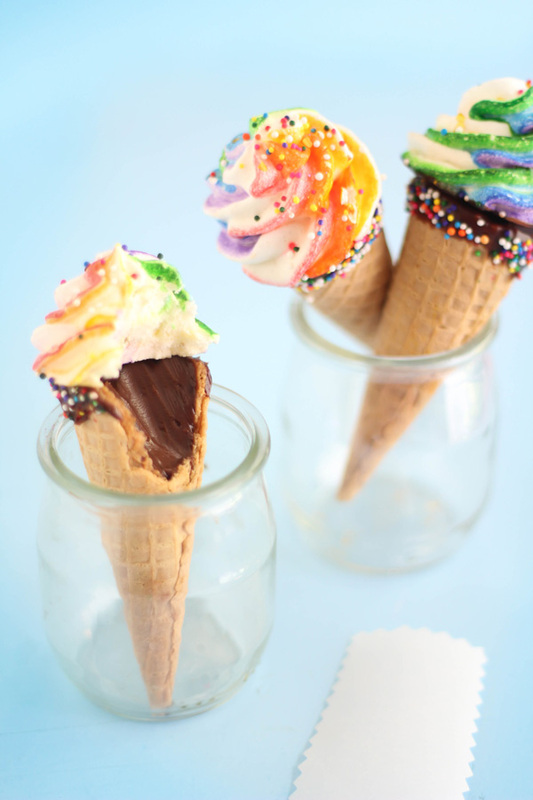 To avoid the cone getting stale, you could coat the inside of the cone with melted chocolate (paint it on with a kitchen-dedicated paint brush) and then let it harden at room temperature. Then, pour in the ganache. Let the ganache set up at room temperature instead of putting them in the freezer or refrigerator. This will take longer, but the cones will not be exposed to moisture in the refrigerator. I hope this helps! I'm sorry they weren't perfect, but it sounds like they were pretty. Oh! I can't believe! They look so insane! These are amazing!! So fun!